There are many websites that open only in a specific country. They are blocked for all the other countries. This is done due to copyright issues or political problems. For example, Hulu, Pandora etc. can be accessed only if you have a US IP address. There are many ways to open these blocked websites. You can use a VPN service to access restricted sites, or you can also use proxies. Here’s a new way to access country specific restricted websites, use Blue Box Proxy Firefox extension. Blue Box Proxy is a Firefox extension that helps you open any blocked sites easily. If you can’t access a website because you aren’t located in a specific country, simply click on the option that says Open With Blue Box Proxy option in the right click context menu. 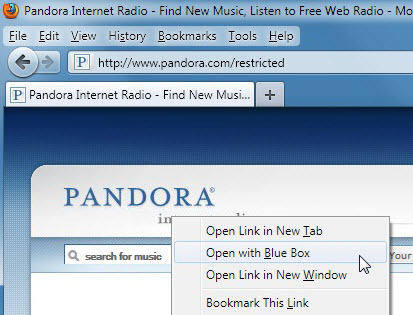 For instance, you can open Pandora from any country with this extension. Blue box proxy works with most restricted sites, although sometimes it can’t open some specific areas of blocked websites. Hope that these issues will be resolved with the newer versions of Bluebox Proxy.